Integrate Ayurveda Into Your Life Off the Mat! Ayurveda is the perfect complement to your yoga practice on the mat! It gives you valuable guidelines on how to choose your diet, your activities and even how to modify your yoga practice. It is a whole way of seeing the world around you. 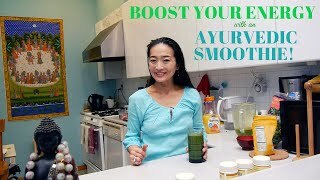 In this video I walk you through how to create an Ayurvedic smoothie to boost your immunity. This is a great spring/summer time drink to start your day. Whip it up and enjoy! Get re-inspired to go for your dreams! In this interview on the Teddy Smith Show, Mariko shares her insights on the process of getting clarity on your Dreams and how to manifest it through inner processes based on the wisdom of Yoga. This is such a classic question that Seekers of all mystic traditions have asked! Tip #1: Create the time to craft your vision - It seems so obvious, but so few people take the time to fine-tune, and to truly align themselves with where they truly want to go. So let's be the few wise ones who set aside the time to embrace this sacred process! Tip #2: Open your heart and your mind to possibility - This is the Visionary piece where we activate our inner Dreamer and give her/him full permission to dream up an inspiring Vision. The difference between 'a goal' and a Vision is that the latter is your ultimate destination, and goals are the milestones that signify your progress towards it. Tip #3: Harness the Power of The Pen - Research shows one common element among top achievers is that high achievers write down their vision and their goals. This simple, yet profound step has proven itself in my life many times. If you aren't quite sure where to begin, consider joining me for my workshop below! Tip #4: Decide How You Want To Feel - So many goal-setting systems are so focused on 'doing' and achieving, and most overlook this essential element. They forget that emotions are the most powerful force in our lives, and that the key to manifesting your dreams with the least effort is to be tuned into the right feeling! 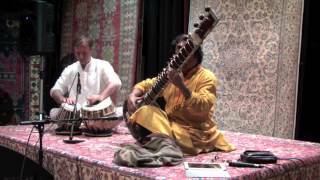 Join me for my upcoming Live offerings! I'd love to meet you in person and work with you to harness the power of Yoga, Meditation & Ayurveda in the service of your Vision for where you want to go in Life. I've got intimate, deep-dive min-retreats in NYC, as well as a fantastic Labor Day Deluxe Retreat right ON THE BEACH coming up! Check out my offerings on the right hand column, and feel free to reach out to me with any questions at the email listed on the left hand side. 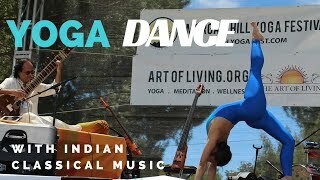 Merging Yoga and Dance with music by sitar maestro Pandit Krishna Bhatt.